Will it fade out and loop back to the beginning? If it loops will he put easter eggs in the loop for us? 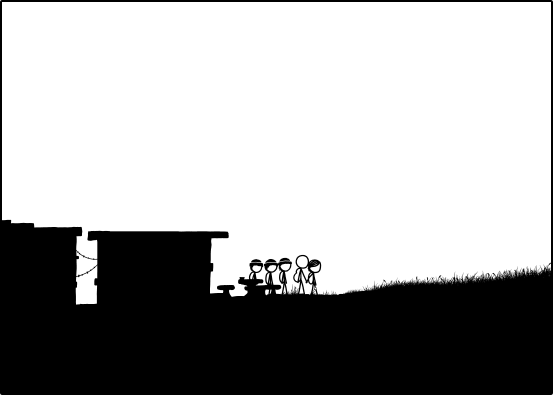 On the bright side, now we have time to give it the full xkcd.com/915 treatment! I'm going to start making my own top-10 frame ranking. Not sure when this happened so it may have already been mentioned, but the title text is now "...."
Double ninja'd in fact. Should have posted right away instead of quickly skimming the last two new pages for any mentions of it. Ah well, wait and learn i guess. Predictions on what Cueganites might look like? Will most of them wear La Petite hats much as Beanies favor beanies? It seems like the dunes occupy a much larger area than shown on Edfel's map (http://edfel.atwebpages.com/Time-Map.php). Perhaps dunes fill the vast majority of that empty space? WalKONG in circles? http://imgs.xkcd.com/comics/time/4a13be03e0885e5fd2e0599d55c333418c3a97754c5da70e8d9e8454dd966e27.png frame 2948 is same scene as frame 2946 , only shifted a bit. Hmmm...is the water flowing in so fast that it's bending spacetime? That's how GR works, right? My ketchup is expanding in a seaish manner so I'm sorry if this has already been addressed, but are we still Timewaiters? Or have we become Timerunners in light of the new commandment? ETA: Oooh, 4! Yappo gets to use some of the dystopian music he made in the film now! BlitzGirl wrote: Chaos is afoot! Time has frozen! Flee for your lives! Or, you know, Wait for it. to say...that chair looks kind of modern. By my measurements that tower is at least 15 cue high...which would be 90 feet if a cue is 6 feet. According to Wikipedia the tallest castle in the world is 128 feet tall, and the 10th tallest is 95 feet tall. So this is a really seaish castle. The stuff inside looks like some sort of scaffolding...I wonder if it's still under construction.